When I looked to the future in the final chapter of What the Nose Knows, one of the things I liked was the possibility of restoring or improving the aroma of fruits and vegetables. The idea of genetically engineered food gives some people a case of metaphysical indigestion, but I see it as a faster and more precise version of what we’ve been doing for 15,000 years: improving on nature by changing genes. One thing I did not anticipate was the use of biotechnology to prevent the off-odors that occur in damaged produce. Consider the oxidized potato: a bruised or cut tuber turns brown and acquires an unpleasant aroma. This results when phenolic compounds released from the damaged plant tissue interact with an enzyme called potato polyphenol oxidase or PPO. Some enterprising Argentine scientists, led by Briardo Llorente at the National Research Council of Argentina, genetically engineered potato varieties that silenced the PPO gene. The result: nonbrowning potatoes. Neato! But what everyone wants to know is, how do they taste? In a new paper, Llorente’s team reports reactions from two sources: lab mice and humans. The aroma preferences of the mice were calculated by how much they spent exploring two food cups in an open field test chamber. When the potato samples were freshly sliced (with no time to turn brown) the mice showed no preference between regular and modified (–PPO) tubers. 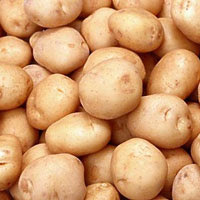 But when the samples were aged for 24 hours, allowing time for oxidation, the mice showed a big preference for the aroma of new fangled –PPO spuds. This fits with an earlier finding that they ate more –PPO potatoes in feeding trials. Sniff tests with human panelists gave a similar result. In a so-called triangle test, blind-folded subjects smelled three samples (two regular, one modified, or vice versa) and tried to pick the oddball. Although the panel did somewhat better than chance with fresh samples, it was a snap when the samples were aged. With oxidized samples the panel correctly picked the oddball 86% of the time. Other feedback showed that while humans find the regular and nonbrowning potato to smell equally pleasant, the modified potato smelled stronger and more familiar. More potato-y goodness. This is the second study to look at mouse and human olfactory judgments in tandem. Llorente’s team took a cue from a French paper, which we blogged about here, that found wide-ranging agreement in the odor preferences of mice and men. Looks like we can extend that result to potatoes. Just tell Mickey to keep his mitts off my fries. avery gilbert: straight pimpin off droppin science. on the daily. As long as they don't figure out a way to silence the off-odors produced by *spoiled* produce, I'm okay with genetic engineering. This blog post has given me shuddering visions of vegetables that never smell bad, no matter how bad they actually might be. Do I have rightful cause to think so cynically? Stop complaining and eat your broccoli.